So how are fossils formed anyway? There are several processes that plants and animals or their parts can be preserved. No matter which way preservation occurs it takes a lot of luck, pure happenstance. Most living things are quickly recycled upon death. Scavengers and bacteria usually consume all but bones and shells. Still millions of fossils have been found. If you think about all of the museums, university paleontology labs, fossil dealers, and private collectors, there really are a lot of fossils that have been discovered! However when you think of the billions and billions of living things that have inhabited the earth over the last 550 million years only a very small percentage are immortalized in stone! 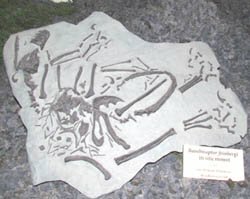 The following is a list with descriptions answering the question “How are fossils Formed?” Generally the top of the list has methods that preserve best though their occurrence is seldom seen. How are fossils formed?Freezing (refrigeration)-This is the best means of preservation of ancient materials. It happens only rarely. The animal must be continually frozen from the time of death until discovery. That limits the possibilities to cold hardy animals from the last ice age. There have been remarkable discoveries of mammoth and wooly rhinoceros found in ice from Alaska and Siberia. Specimens with flesh, skin, and hair intact have been found. Some of these finds suggest that they were flash frozen, with food still in the mouth and stomach. Drying (desiccation)- Mummified bodies of animals including humans have been discovered in arid parts of the world. The soft tissues including skin and organs are preserved for thousands of years if they are completely dried. How are fossils formed?Asphalt- In what is now downtown Los Angeles lies a 23 acre park called The La Brea Tar Pits, officially Hancock Park. Within the park are over 100 pits filled with sticky asphalt or tar. The tar pits were formed by crude oil seeping through fissures in the earth. The lighter elements of the oil evaporate leaving thick sticky asphalt. The pits are famous for the number and high quality of Pleistocene fossils that have been pulled from the pits. The fossils date between 10 and 40 thousand years old. Asphalt is an excellent preservative. 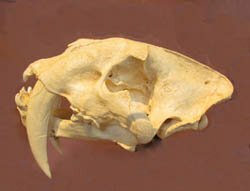 Bones, teeth, shells, the exoskeletons of insects, and even some plant seeds have been pulled from the pits.And of course many saber tooth cats. How are fossils formed?Amber- Insects, spiders, and even small lizard have been found, nearly perfectly preserved in amber. Picture this scenario: A fly lands on a tree branch in an area that is now the Baltic sea. While looking for food it steps in sticky sap that the tree has made to protect itself from fungal infection. As the fly struggles to escape it becomes more and more entombed in the sap until it is completely engulfed and suffocates. The tree eventually dies and falls into the swampy water from which it grew. Over the course of millions of years the tree along with countless others becomes a coal deposit and the sap with our fly inside is polymerized and hardened into amber. As more time passes the coal bed is submerged as the sea level rises. Eventually the currents uncover the coal bed, slowly eating into the Surface, little by little. When the erosion reaches the amber it floats to the surface because it is lighter than the salty water. It is then washed ashore where it can be found. 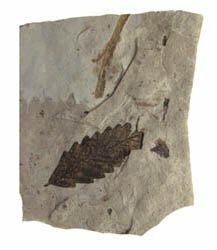 How are fossils formed?Carbonization (distillation)- In this process of fossilization plant leaves, and some soft body parts of fish, reptiles, and marine invertebrates decompose leaving behind only the carbon. This carbon creates an impression in the rock outlining the fossil, sometimes with great detail. How Are Fossils Formed? The Work of Ages. Fossils have also been created by peat bogs, paraffin deposits, and volcanic ash.